Bethesda is known for their massive singe-player franchises to a degree that they advertised, albeit humorously, how fun it is to play in your own company when everyone else was jumping in a multiplayer bandwagon. In a surprise move, Bethesda steps into unfamiliar territory with Fallout 76. The newest entry in the post-nuclear roleplaying series is, for the first time, an online multiplayer game. So, I set up my alarm to wake me up at 2:00 AM to join the first closed Xbox One B.E.T.A (Break-It Early Test Application) for Fallout 76, to taste how the air will smell in West Virginia. Luckily, the next B.E.T.A sessions were available a couple of hours earlier so I could enter them feeling more alert. In past reviews, I have mentioned my obsession with creating characters in games. It can take me ages to meticulously shape a face that I’ll likely be seeing for dozens of hours. Due to the short time the first B.E.T.A was open, I couldn’t go to my usual lengths and uncharacteristically quickly cobbled up Frankie. 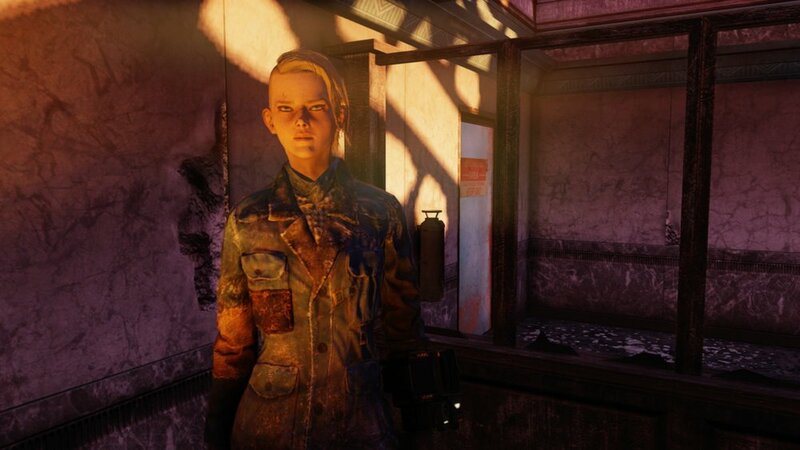 She was ready to step out from the comforts of Vault 76 for Reclamation Day, the day when the Vault’s “all-clear” signal opens the underground bunker allowing Vault-Tec’s hand-picked survivors to venture out into the irradiated wastes and make post-nuclear war America great again. The world looks the same as it did in earlier Fallout games, a seemingly serene ghost world of abandoned suburbs, cities and polluted wastelands. Only, there’s no one else occupying the world except player-created characters. The series typically showcases a lone survivor embarking on a journey through a crazy world ruled by the law of the jungle. But where have all the people gone in West Virginia? No NPCs, no mad factions, no one! Quests are picked up from eerily functioning terminals left over from the old world and it’s up to you to uncover what went wrong with the Responders, the area’s earliest settlers who have been found dead. At the start of the adventure, you’re taught basic survival skills, like crafting weapons and armor, boiling contaminated water and preparing meals. 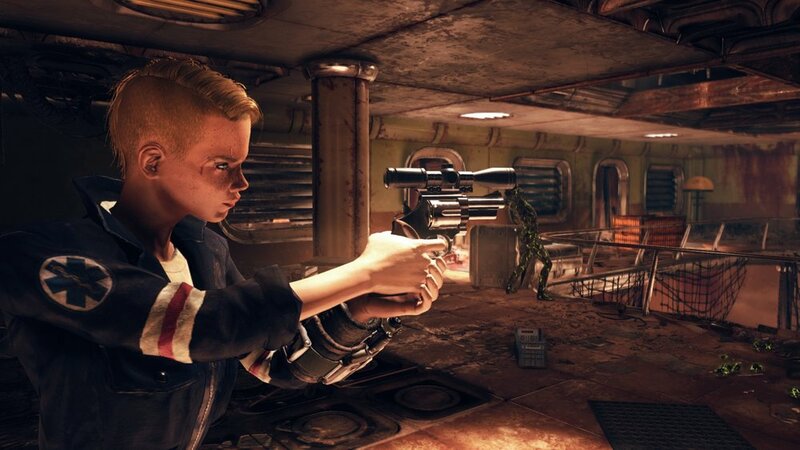 Thirsty and hungry characters suffer from penalties to their action points that are governed by the Vault-Tec Assisted Targeting System. From Fallout 3 onwards, V.A.T.S. slowed time as it targeted an enemy’s individual body parts often leading to cinematic views of critical hits and killing blows. In a multiplayer game, though, such personal time bubbles can’t exist. Instead, V.A.T.S. works like auto-targeting. It took some time to get used to but it was an invaluable asset in shooting down nippy critters, especially when equipped only with a single-load pipe pistol. Of course, there are perks that ease fighting and survival. Perks are based on cards selected when you level-up and can be equipped and switched out for character builds on the go. Once in a while you’re rewarded with a card pack containing random perks. The social aspect of Fallout 76 is what you’d expect from a modern multiplayer game, complete with party invites and emote wheels. The first quests were easy enough to solo but taking down a wandering Deathclaw requires a robust party of well equipped survivors. A shared game world hosting 24 simultaneous players in an instance means waiting for your turn to use crafting stations. It adds to the immersion that other characters are on the same business as you, settling in and surviving as they can. There are public events much like in Destiny and Final Fantasy XIV, such as fending off a mutant attack everyone nearby can join in. I was feeling a bit grumpy in middle of the night and I didn’t care much for company, party hat or no, and found that everything moved along nicely by myself. The game map is large enough that when everyone parted ways, it was quite rare to bump into anyone. In a world where an unexpected pack of super mutants can make a short work of you, expect to die just as quickly. After dying, I respawned back into the world and could run back to my last known location to collect a brown bag containing my dropped items. This felt a bit strange at first because previous Fallouts let you save at any time and reload even in mid-fight if things went sour. Luckily, you keep weapons and armor no matter what, letting you fend off dangers on the way back. There are several checkpoints during quest phases to mark entry points when you log back in after exiting the game. For me, the first B.E.T.A ended when the connection to server was cut a few minutes earlier than scheduled, breaking Frankie’s ability to move. I thought that to be a cue to catch some shuteye before dawn broke. In the following B.E.T.A sessions, I explored the world in more detail, took detours from the main quest to see different sights and got introduced to the much-touted base-building. I hated settlement management in Fallout 4, greatly neglecting the needs of my so-called community and instead adventured selfishly on my own. The base-building works exactly like in Fallout 4, with similar (and clumsy) interface to place down floors, walls, turrets, crafting stations and whatnot. You can also claim places such as workshops and build defenses around them because other players can try to claim them for themselves, cue world PvP. It remains to be seen how obtrusive the base management will eventually be. I’d be content with a sleeping bag, a storage and a cooking fire in the woods! It’s strange, really, how Bethesda hangs onto to their aging game engines, patched frequently to keep up with the times. Even though the scenery and autumnal colors are striking (I think Bethesda has taken a note or two from popular Fallout 4 mods to enhance the environmental lighting), the resolution, geometry and frame rate on basic Xbox One were pretty moderate. Performance issues were promised to be fixed with a day one patch, though. The character editor is exactly the same as in Fallout 4 and it would really need an overhaul to satisfy an ever-growing demand for better details and definition (though I really liked how you can pretty freely alter the character appearance afterwards through the C.A.M.P. menu instead of sitting on a surgery chair in select places, like in Fallout 4). Don’t get me wrong, I love the aesthetic of Fallout 76, it just isn’t technically so impressive. Bethesda doesn’t seem to exactly have an own angle to tried and tested multiplayer-RPG mechanics. From what I did experience, Fallout 76 don’t bring much new to the table and conforms to the genre laws. On one hand, it makes the game appear old-fashioned but at the same time, the transition to online gaming has been surprisingly natural. As if it was always meant to be like this, as everything works as intended - more or less intuitively. Traditional Fallout gameplay is almost intact as I felt right at home exploring ghost towns, abandoned factories, medical facilities, roadside diners and other points of interest, looting them from goods to add to my ever-growing inventory of weapons, apparel and aid. It felt like playing a part in The Omega Man – with some random players popping up in sight. Fitting the game into multiplayer framework comes with some missteps. I loved how Fallout: New Vegas presented multiple ways to approach quests. Such versatility was already damped down in Fallout 4 but here, there are no alternative solutions in the quests I completed. It makes me wonder if there are even conversations to have with NPCs further in the game. Charisma perks can’t be there for no reason, can they? Flashing a charming smile to get a discount from vendors would go waste if all of them were just machines. What Fallout 76 has most strongly going for is its immersive world and how it stubbornly sticks to the series premise. When you leave the Vault, you’re greeted with the same palpable decadence and decay of long-dormant surroundings you’re used to see in the series. It’s almost like watching pictures of Chernobyl, only basking in a rusty Americana and turned into postcards from the post-apocalyptic world pretty much trademarked by Bethesda by now. Oh, you can also make those postcards, as the built-in photo mode is easy to call up and intuitive to use (for this preview, I kept screen captures natural without any applied filters or frames, though). Uncovering the mystery of a catastrophe that brought the world to its post-apocalyptic state is motivational enough and perhaps catching up with NPCs could inject some vividness to the desolate experience.